"We stand as brothers and sisters tonight. Pack beside pack, rival beside rival, bound by blood and moon against the forces that would come here and murder us all and our kin. Someday we may have the luxury of fighting amongst ourselves again, but not tonight. Tonight we are one. Tonight we go to war." 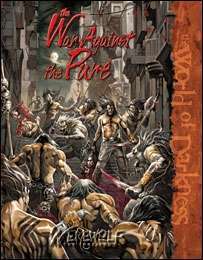 War Against the Pure is a supplement for Werewolf: The Forsaken. Can you use the different forms of shapeshifting mentioned in this book when playing a second edition game or do you have change/improvise on the rules front?